RideReady is the best way to prepare and be confident for your next FAA Practical Test (also known as a "flight test" or "checkride."). 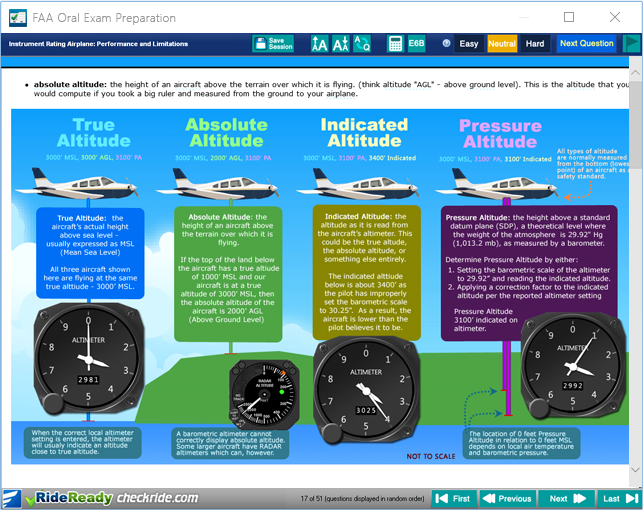 The content of RideReady consists of large, often illustated, and regularly updated question sets drawn from actual checkride experience (our editorial team consists of senior flight instructors and designated examiner pilots) that you study in an active challenge-response way to mimic actual Practical Test conditions, where an examiner will ask you similar questions. It is unique in both including specific questions pertaining to a large number of common training aircraft and in offering lifetime free updates, meaning that you can start studying early without worrying of being 'locked out' of new content as it becomes available and that you can review long after your checkride. It is available on a number of platforms, including PC and iPhone/iPad and has won industry praise both of its depth of content, innovative use of technology, and providing time and cost efficiency to the end user compared to review booklets that are too thin on content and nearly totally lacking in insight and DVD/video based reviews that are are boring beyond words, expensive, and consequently ineffective. RideReady has been used by tens of thousands of pilots to successfully prepare for FAA checkrides and is in use institutionally at a large number of professional flight schools and university flight departments. We invite you to be next! 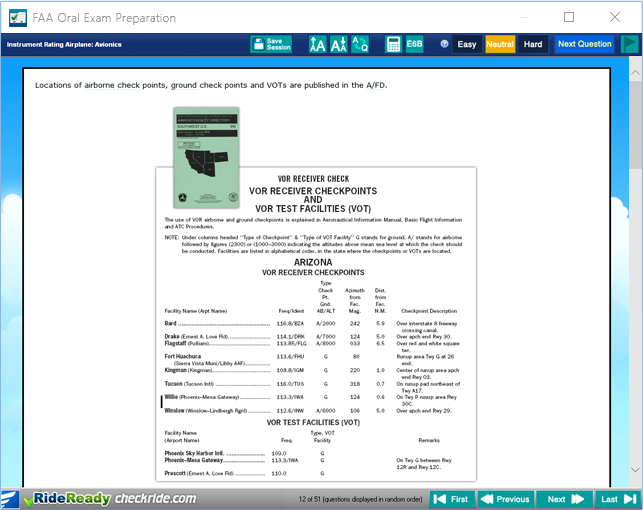 RideReady has many, many more checkride oral exam questions than those booklets do. Our questions are drawn from actual pilot checkride de-briefings and examiner experience. We work to constantly update the material to keep it up to date as we get post-checkride reports from pilots like you and as FAA rules change. Updates are always free and are simple to get using the built-in update utility. Compare this to a book which is basically becoming obsolete the moment that it is printed. While such books write generically about airplanes, chances are that this software knows about the specific aircraft that YOU fly. You tell RideReady which aircraft you are training in and then it will ask you questions from its database about your airplane. While RideReady's database includes questions for many common trainer types, if your aircraft is not included, you can enter 'custom' aircraft details. Typical books ask only dry, fairly "rote" questions. 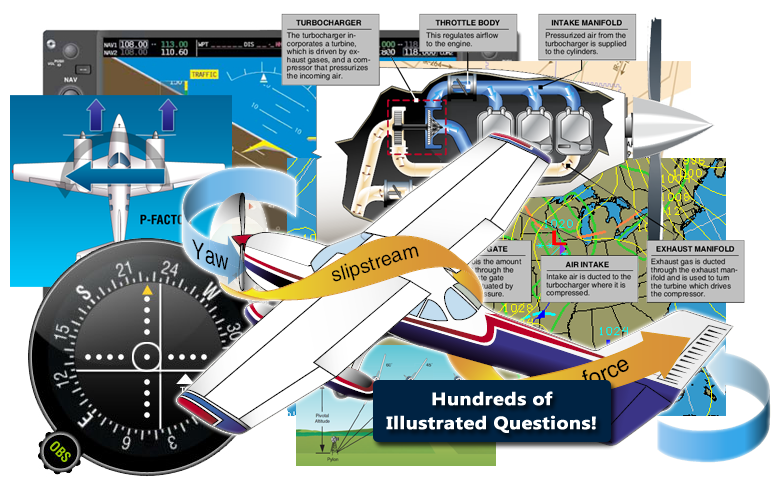 While you are likely to be asked some such questions on your checkride, you will also be asked a number of reasoning and scenario-type questions. 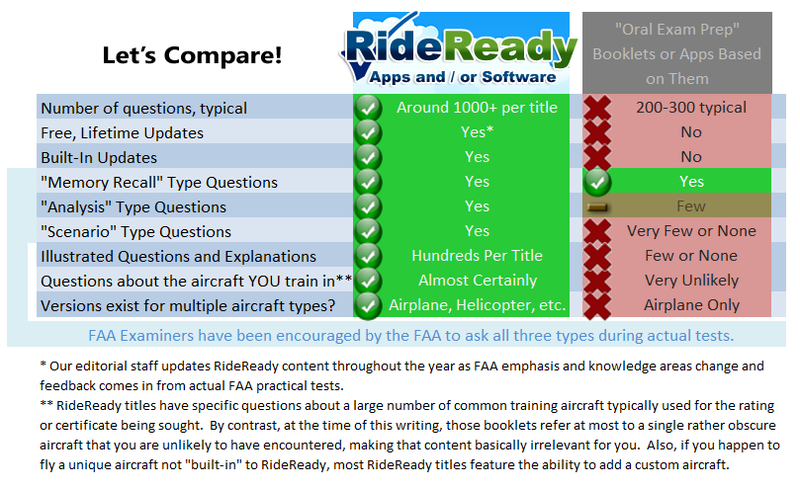 RideReady includes all types of questions that you are likely to be asked on your FAA checkride oral. RideReady includes hundreds of charts and figures to assist your learning. RideReady is easy and convenient to use. We take pride in making products with excellent usability so that you get the most studying possible done in a given amount of time. ... but don't take our word for it! You can download the (PC version) demo of RideReady FREE and decide whether it's right for you before you buy it. We can't give you a full answer, since we've never been able to find anybody who has sat through one of those DVD-based preps without falling asleep. Seriously though--there is definitely that, but there's much more, too. Most of the items in the above list apply as well (including, crucially, that you can get the latest updates for life, quickly from ours, while those DVDs are static forever), but what it really compes down to is that RideReady lets you study up-to-date information at your own pace at a far, far more reasonable price than competing DVD sets. Certain DVD companies seem to have made a fortune based on luring pilots into believing that because the DVD sets are ridiculously expensive that this will somehow translate to effective learning when. In reality, a great many of those DVD sets go unwatched beyond the first few minutes. Smart pilots have come to appreciate the speed and effectiveness of RideReady - remember - all of our materials are maintained by an editorial team of Designated Pilot Examiners and Flight Instructors with real experience that you can count on. If you do choose to buy it, the ordering process for RideReady is easy, secure, and immediate. You can be studying for your checkride oral exam prep in just moments from now! 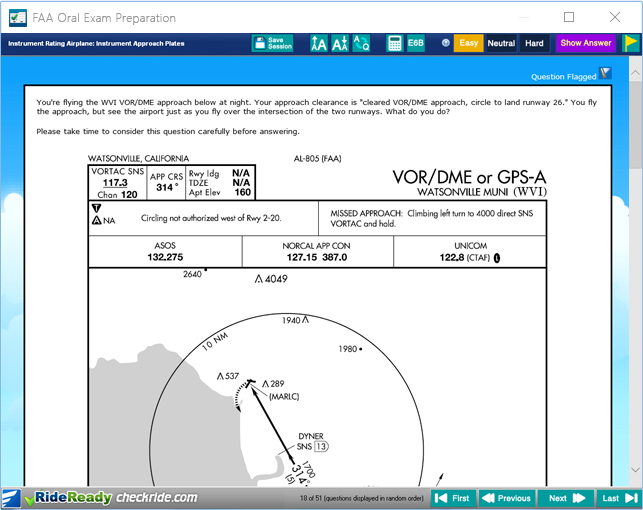 This software is intended for all pilots who are contemplating taking an FAA Practical Test (more commonly known as a "checkride" ). A practical test is the certificate test that you take with an examiner pilot at the end of your training for a certificate or rating. The checkride (essentially) consists of a flight portion, wherein you are tasked with performing maneuvers that you will have been trained on and an oral portion, where the examiner will quiz you on any of a large number of aviation matters. 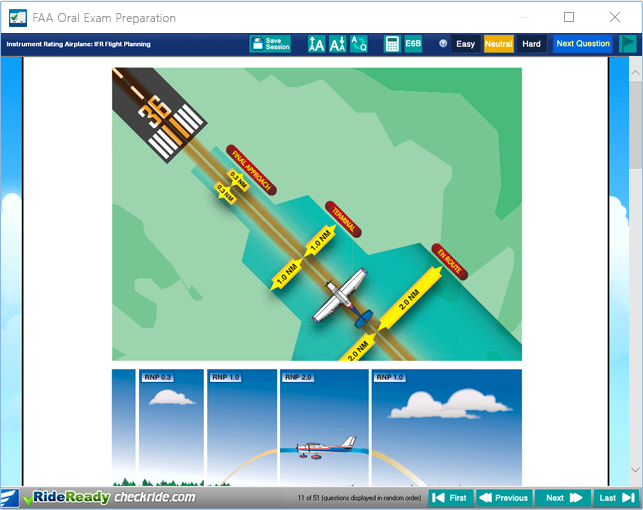 This software's primary goal is to help you be ready for the oral portion of the checkride. As a secondary benefit, it will also to some degree help you study up on the flight maneuvers that you will need to perform as a double-check that your knowledge of those is up to standards. Because this software contains a large question bank, it is also useful not just for checkride applicants, but also for certified pilots who can use it as a lookup and refresher tool. What specific aircraft does RideReady include system information for? RideReady is a useful tool regardless of whether you fly one of the below aircraft or not. 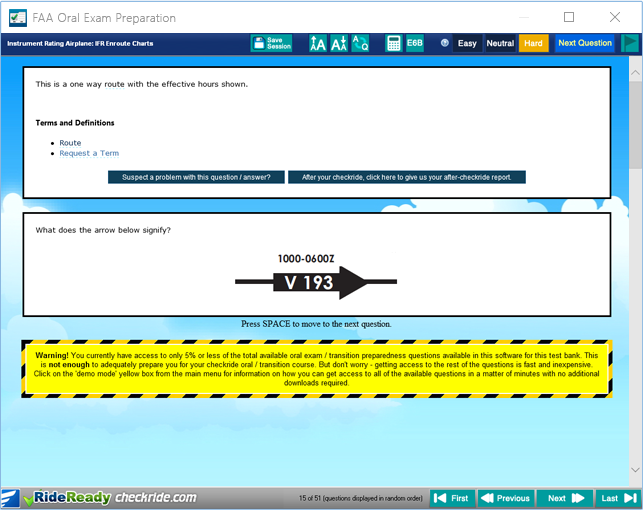 Each RideReady version contains hundreds of questions that are generic to the specific practical test being studied for. If your aircraft is not listed above, don't worry! You can always add it as a "custom airplane" in RideReady. This is answered in the "Top Ten" list higher up on this page. We believe that RideReady is a better tool that can get you better prepared and often in less time than those limited-content books. 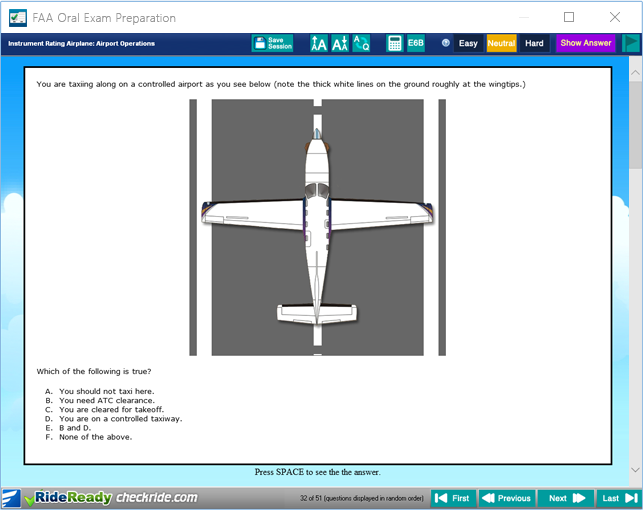 In short, RideReady is designed to better simulate the sorts of questions that you see on the checkride. RideReady was written by professional pilots and flight instructors of Dauntless Software. It was helped along by conducting exit interviews of dozens of flight students throughout the country. Additional material and suggestions were supplied by at least four current and former FAA Designated Pilot Examiners (DPEs). Where it is advantageous to do so, many answers contain text directly from the FAA and other government agencies so that you are trained on answers exactly per the FAA's thinking on the matter. Why does RideReady not grade answers right and wrong like, for example, your GroundSchool FAA Written Test prep software does? The answer is "definitely no! however..." No examiner expects you to know everything. RideReady is written such that if a person knew everything that is in there, he/she would likely be an amazingly outstanding applicant. A small percentage of the questions included in each test prep (especially the earlier stage ones, such as Private and Recreational Pilot) are beyond what is normally expected of applicants. We nevertheless include a few such questions to allow you to potentially be truly impressive. So, don't worry if you don't know all of the answers. Your goal is really to be functionally literate in the subject matter. "I don't know, but I know where to look that up" is a perfectly good answer for some checkride oral questions - but just don't use it too often! Your primary goal is to demonstrate to the examiner that you have competence in the material and that you have good, safety-minded judgment. The examiner is not expecting you to know everything, but don't take the oral lightly - people probably fail the oral exam portions of their checkride just about as often as they fail in flight tasks. You want to be over prepared rather than under prepared. How does RideReady ask me specifics about my aircraft? In RideReady, you select from a list of common aircraft for a given certificate or rating. For example, for Private / Recreational Pilot, RideReady has question sets for a variety of common Diamond, Cessna, and Piper aircraft. Once you select an aircraft, the RideReady will ask you questions about that particular aircraft (for example, it could ask you questions that pertain to the fuel system design of your particular aircraft). Furthermore, because for a number of reasons there are variations between even the same type of aircraft (for example, one particular aircraft might have special wing tips installed that lower the published stall speeds), RideReady allows you to further customize many specifics so that its questions will best reflect your particular aircraft. Furthermore, if RideReady just doesn't have the aircraft you are using, you can always enter data for a generic aircraft. 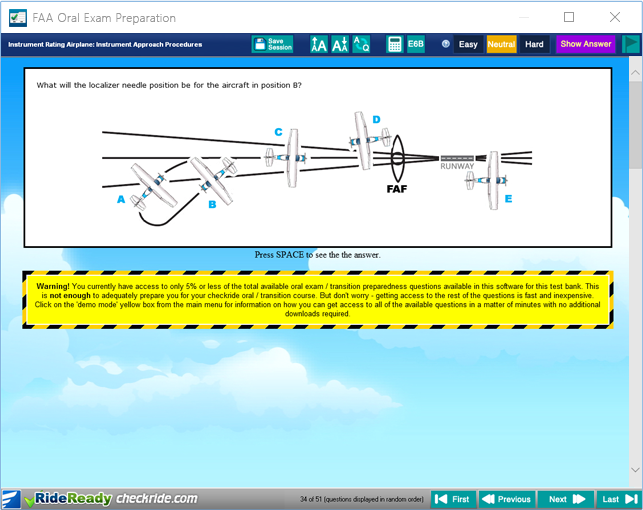 Since aircraft systems, performance, and limitations are a key FAA emphasis areas on checkrides, the ability to customize the quizzing to your aircraft's needs is a particularly important advantage of RideReady over books, which typically only talk about generic aircraft. Including Fundaments of Instruction (FoI) knowledge areas required for FAA CFI checkrides. Get your aviation career off right! For the serious and dedicated pilot. Includes RideReady Private Pilot, IFR, Commercial Pilot, and Flight Instructor titles at a special combo price. Remember, all RideReady titles include free lifetime upgrades. For the serious and dedicated professional (airline?) pilot of the future! Includes all six airplane RideReady titles at a special combo price. Includes free lifetime upgrades, so even if it will take you some years to finish all these certificates / ratings, it'll be waiting for you. Plus, you can get started training early, which will make your training as smooth as possible. 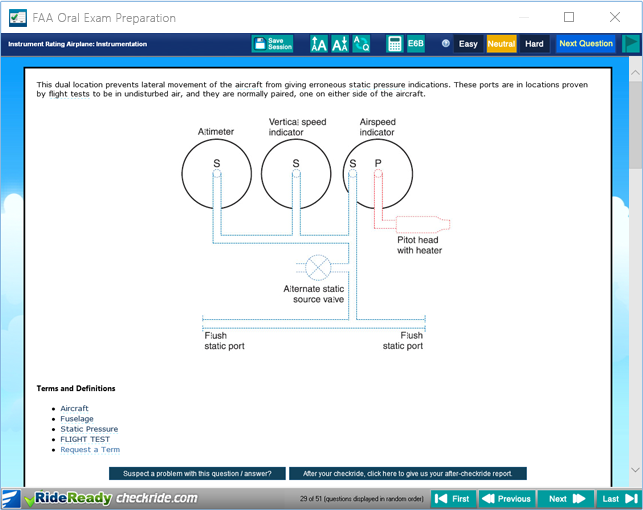 RideReady: SeaPlane pilot will help you prepare for either the Private Pilot Seaplane or Commercial Pilot Seaplane checkride (either add-on or initial). Make your transition to tailwheel flight as easy as possible by learning the knowledge material first by using RideReady: Tailwheel Transition before or during your tailwheel course. Each test bank covered by RideReady includes hundreds upon hundreds of questions. The exact number that you will see depends on the aircraft, specific test, and other configuration options that you have selected. Certainly, each RideReady test bank has many more questions than those oral exam prep books do, and more questions still are being added as feedback comes in and FAA rules change. Thanks for checking out RideReady! Good luck in all of your aviation goals!